I can’t believe how into this patch thing I have become. I’m constantly searching ebay every day looking for some good stuff and I’m finding that it’s real easy to find it and surprisingly easy to not break the bank with some of this stuff. This is some of the most fun I’ve had to collecting in a long time. Two new cards today. .. The first is this patch card of Reggie Wayne from the 2008 Topps Triple Threads. First off, no it’s not really this neon green in person. The light from the scanner just made it brighter. As you know, I’m a big Colts fan so getting a patch card of one of my favorite players is pretty cool. The card is numbered #2/9. All in all, the patch and the card design could be a lot better but for what I ended up paying for it, I’m certainly not complaining. I imagine I’ll upgrade my Reggie Wayne entry as time goes on. For now, this will do. The second new card I got was this Josh Beckett card (#9/9). This is from the 2008 Triple Threads and features patches from Beckett’s All-Star Game warm up jersey from the 2007 game in San Francisco. Some people may not like these cards, but I think they’re pretty cool. They are certainly a step up from Topps’ previous attempts at the All-Star Game patch cards where they gave you a tiny window and just one small glimpse at the patch. At least with these you get three windows and you get a nice view. This was another card that I got for way cheaper than I really expected. I kinda just threw out a low bid on it and it happened to stick. Again, not complaining. Beckett is one of the best pitchers in baseball….when healthy. Sad that you actually have to make that point when discussing him. I did manage to win a couple other cheap patch cards earlier this week but I didn’t get them paid for until yesterday so it’ll likely be next week before I get them. Most were cheap pickups but there was one card where I put down a serious bid and won it. I’m anxiously awaiting that one. Morneau Triple Auto – I’m weak!! About a month or so ago I wrote a post on here talking about one of the hardest items for a player collector to have to deal with….the multi player card. In the post I said that for me, it ultimately it comes down to who else is on the card. This was one of those instances. When I saw this listed on ebay I knew I had to have it. Once in awhile I will see a card and feel a strong need for it and I’ll bid up until I get it and this was one of those instances. So why feel this way about this card? It’s simple. It has Morneau and Mattingly. When I was a kid growing up in Indiana, Don Mattingly was my hero. I wanted to be just like him and even adopted his mannerisms in my own baseball playing days. This was before baseball games being on ESPN so I saw very little of the Yankees on TV but followed Mattingly closely. He was the first player I ever collected. I collected lots of cards but I had more Mattingly cards than anyone else. I even made my mom drive me down to Evansville twice to eat at his restaurant (Mattingly’s 23) during the winter in hopes that he might be there. So to me this card is special since it has my favorite player from my youth and my favorite player from the present. I don’t know of any other cards featuring the two together but if anyone does, please let me know. One of the most annoying thing to me in this hobby is the rise in the pricing of what many call the “high end” products. I’m talking your UD Premier, Black, Exquisite and Topps Triple Threads, Sterling. Granted, you will pull some nice cards from these boxes, but you also pull a ton of garbage. What really bugs me the most is that these card companies aren’t really even putting the value into the box. If someone is paying around $180 for a box of Triple Threads, they shouldn’t have to suffer through a pull of a autographed triple relic (all single color swatches) of Bill White. Yes, the same Bill White (Texas) who pitches a total of 9 innings in 2007 and then posted a 20+ ERA in 4 innings this year and was recently outrighted to the minors. I’m sure Bill is a wonderful person, but where the hell is the value there?!?! Topps isn’t alone in this mess. Upper Deck does the same crap and tries to wow us with single color swatches and call them “high end”. In addition to lame relics and lame players, the value on these cards just doesn’t really hold up to the MSRP they slap on there. Last night I won an auction for a UD Black Justin Morneau autographed card. This is a product that was priced at nearly $200 per box when it was released (I could be wrong on that so someone correct me if I am). I grabbed the card for a paltry $14. So here is my plea to Topps and Upper Deck….FIX THIS! You have two options. You can either: A) Fill these products with cards that are worth the price. I’m talking patches only. There is no reason to have single color swatches in products this expensive. And only put players in there that are stars. Don’t give me long time minor league guys that get a call late in the season and super sub bench players. Or B) Lower the price on these products to better reflect the stuff in the boxes. No one is getting their money’s worth with what you’re asking for now. Upcoming baseball products. Anything good? It’s been a slow week on the acquisition front (although I’ll have a post tonight after I can get some scans) so I thought I would post about some of the remaining 2008 baseball products (in order of current release date) from a Morneau and general perspective. After having “By the Letter” sets in each of the last two SPA products, Upper Deck has thankfully left Morneau out of that line this year. Last year’s product was a major headache for some player collectors as the BTL cards had more than one combination and different numbering. The base cards are blah and I imagine they’ll be the same this year. With boxes over $90 per, I’ll be passing on this until the price drops down a ton, which it will if this product is anything like last year. This is one of those products that I really have no idea on. I haven’t seen a checklist on this anywhere so I have no idea if Justin Morneau will have anything in here other than a base card. The boxes here are pretty pricey (~$220 per), but you do get 12 autographed cards and some other goodies per box. Now, if the auto checklist is better than the crap list from this year’s Triple Threads, then I could see maybe picking up a box. But the fact that we’re now less than a month out for this one and I haven’t seen a checklist makes me think this will end up being overpriced garbage. Normally Sweet Spot is a pretty good product for player collectors. Each player seems to have a few different cards with varying material (ball leather, bat, glove leather) and various inks used for signatures. Plus, these cards don’t hold a ton of value and can be picked up on the cheap on the secondary market. You get 6 packs per box this year and only one will have the “Sweet Spot” autographed card. It strays from the tin idea last year with 1 pack per tin and the auto in that pack. This is more like how Sweet Spot was initially with the boxes with multiple packs. The checklist shows a Morneau “Sweet Spot” card but that’s all it says. Hard to say if this product will be worth the coin (~$100 per box), but my guess is that it will fall well short. This is another “wait until the market bottoms out” product. Hopefully I’m not alone in thinking this way, but last year’s Ultimate was a train wreck! Ugly cards, bad relic pieces, lame checklist, and seriously overpriced. There are Morneau cards from that product that I have absolutely ZERO interest in chasing. This year it looks like UD has decided to try to really beef up this product. Morneau doesn’t appear in the current checklist all that much….just a base card and a couple cards with his signature with a couple other players. I’m pretty disappointed in this since UD has some really cool cards in this product this year featuring signed oversized jersey swatches and oversized bat barrel pieces. The product to me actually looks so good, I’m considering doing a case of it and I don’t do cases all that much anymore. I just wish there was more Morneau in there. I guess I’ll kick things off on here with a couple cards I got in the mail today. The first one I got was this 2002 Bowman – Signs of the Future autographed card. When I came across this one on ebay, I didn’t even know it existed. 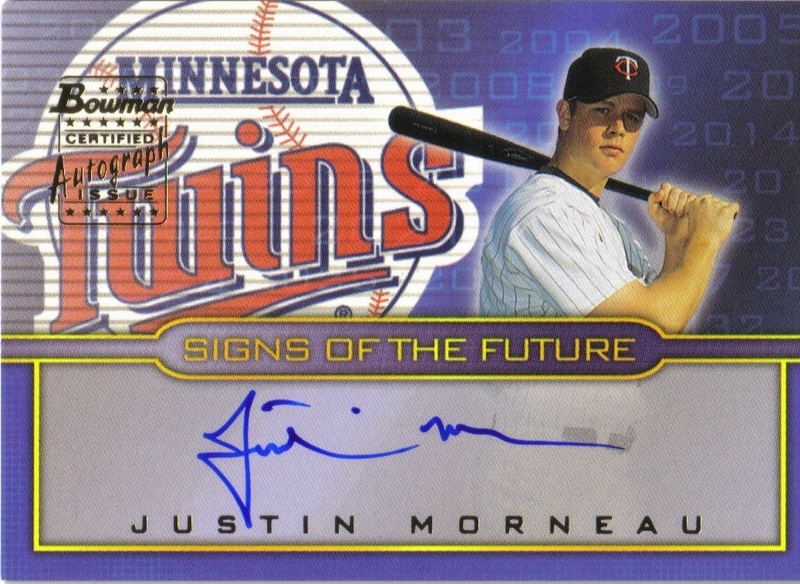 I knew Morneau had an autographed card in the 2001 Bowman product but I didn’t know he was in the 2002 as well. I love the Bowman autograph cards because they are all hard signed on the card itself and not on a sticker. I have one friend who is a firm believer that years from now all those sticker autographs are going to disappear and fade away completely. He may be right. 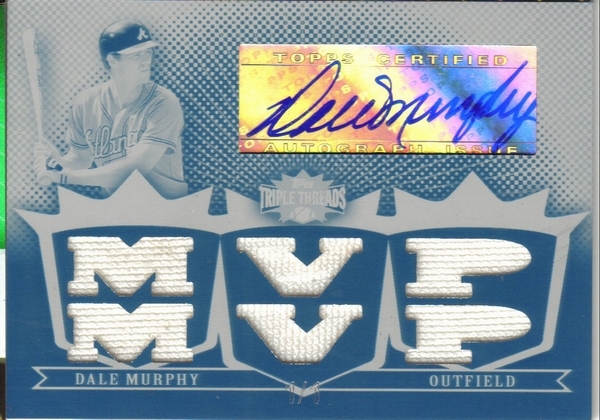 The other card I received today was this autographed relic card from the 2007 Topps Triple Threads product. All in all, this is pretty bland as far as autographed relics go. 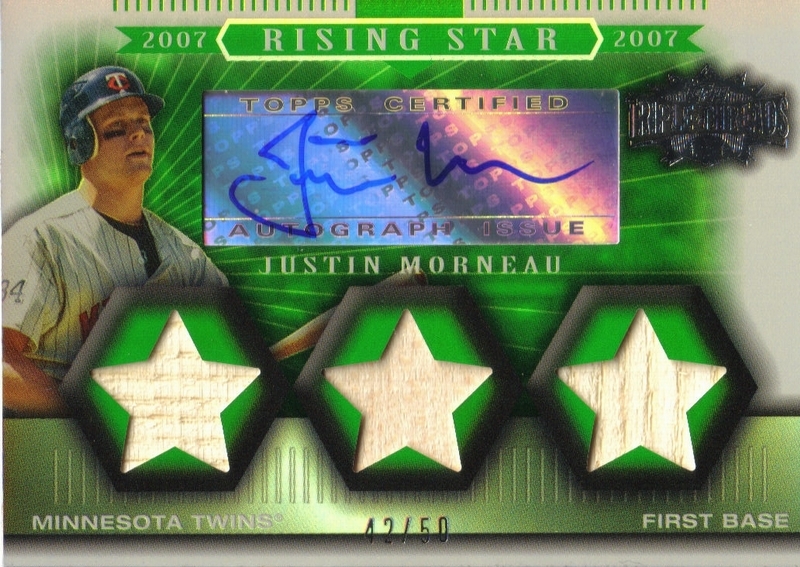 For some reason, it seemed like Morneau got the shaft in the 2007 edition since most of his cards featured 3 bat pieces and none (at least none that I’ve seen) seem to have anything cool like a patch. I originally gave some thought to trying to collect one card from each parallel color from the series but after giving it some thought, I dropped that idea. If the relics were a little cooler, I would consider it, but as they are, I can skip them. This one was the Emerald parallel and is numbered #42/50. Another solid game tonight from Morneau (3-5, 2 RBI) but the Twins lost and didn’t get a chance to gain a game on the White Sox (who also lost). Honestly, I’m a little torn on whether or not I want the Twins to win the division. On one hand, it would be cool to see them win. On the other hand, if they win, I could see Morneau getting quite a few MVP votes. A second MVP in 3 years would drive up the price on his items and make my life tough.